! New Album released ! Contact us to get a physical CD of our album! Impressions from our release concert. Be part of the band, whip out your instrument and join our jam in Metamorphosis 2.1. Check out Superimposition recorded at Fattoria Musica during our album recordings. It’s official: Tomorrow is our album release concert at Theater Het Hof in Arnhem. If you want to find out if there is going to be a special offer you should definitely come and see. Call for cover-artwork is over: We officially have chosen a cover-artwork. You can soon admire Tabea Ph‘s suuuper cool artwork! Congratulations, we really liked the way how she translated our music into her own work. Damn impressive! Curious yet? You should be!!!!!! Listen to a few sneak previews for our upcoming album. How do we look live on stage? How does it sound together with our music? How does our music sound live? Who is playing which instrument? If you are bothered by those questions you should look at this video! A must for every music enthousiast. How much love do you get from the TCO Luv – o – Meter? Pictures from our last concert live @ Brebl, Nijmegen can be seen here. Awesome show: sold out venue and great audience with a great vibe!! Thanks to everyone who came! It was an honour to open the Festival Jazz International Nijmegen. Here is a short impression of our show! 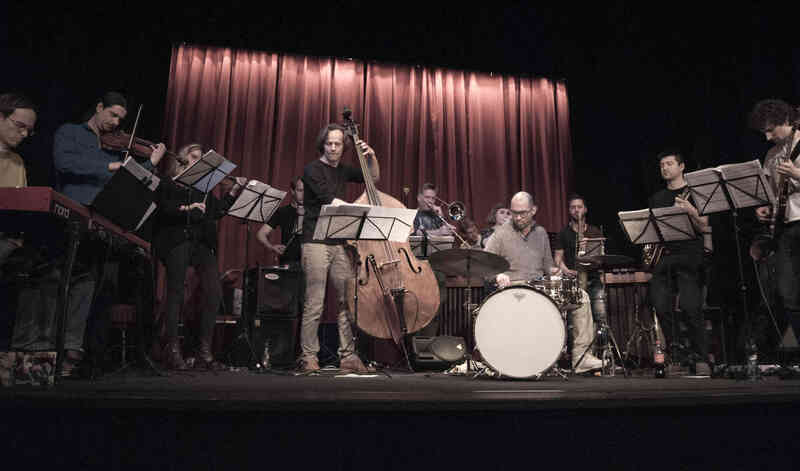 The Chronometer’s Orchestra, under the artistic management of Zacharias S. Falkenberg, combines the essence of modern classical music with experimental Jazz. Falkenberg’s influences in music are amongst others: Frank Zappa, Soft Machine, Django Bates, Miles Davis, Igor Stravinsky, Karlheinz Stockhausen and Gyorgy Ligeti. The music radiates the feeling of rebellion and anti-establishment, one can say it’s Punk and Alternative. TCO is a true underground insider tip for people who like to keep up with the cultural world, but also like to party! That are the concerts of TCO! TCO has a peculiar setting: 5 horns, a stringquartet and a rhythmsection consisting of piano, 2 guitars, upright bass, marimba and drums. Members of the group include well-known musicians as drummer Yonga Sun, bassist Dion Nijland, pianist Philipp Rüttgers and the renowned Matangi string quartet. In august 2016 Falkenberg was the first awardee of the prestigious Rogier van Otterloo Award, rewarded by the Metropole Orkest. This orchestra is special through its concept, exciting through the combination of different styles that seamlessly merge together, which may be mentioned as a compliment for the composer, who passes glamorously in a field where a lot of predecessors hopelessly got lost. The Chronometer’s Orchestra is an exciting new band, operating in the area of true contemporary jazz. Contemporary because of all the influences that inspire young and talented composer Zacharias Falkenberg. He blends everything together in a refreshing meltpot of jazz, rock, classical music and freer forms of improvisation. Falkenberg’s composing chops are of a mature skill, with an intelligent sense of humour and always communicative to the audience. Members of the band are young, gifted and dedicated to make the most of the compositions, and amongst them some interesting soloists. Great for clubs and concert halls, and highly recommended for festivals. The Chronometers Orchestra is a brisk band with versatile possibilities with strong ensemble players as well as soloists. Its leader is an adventurous composer, always pushing the limits in his composing, with great scoring for strings, horns and rhythm and sophisticatedly using instruments as well as the band members. Special thanks to Marc Brodbeck for financial support and realising our foundation “The Chronometer’s Orchestra”.